One of a bunch of major releases due to launch next week, Far Cry New Dawn has a lot going for it to ensure it stands out from the crowd. For starters, it's a post-nuclear apocalypse in which lovely pink flowers prevail across almost every bit of Hope County, Montana, and it has two interesting antagonists in Mickey and Lou. Speaking to Art Director Isaac Papismado, we asked about what's happened since 'The Collapse' engulfed Hope County, and what series stalwart Hurk has been up to over the intervening 17 years. There's also info on your home base of Prosperity, where you can build your own community and safe haven for crafting and customisation. 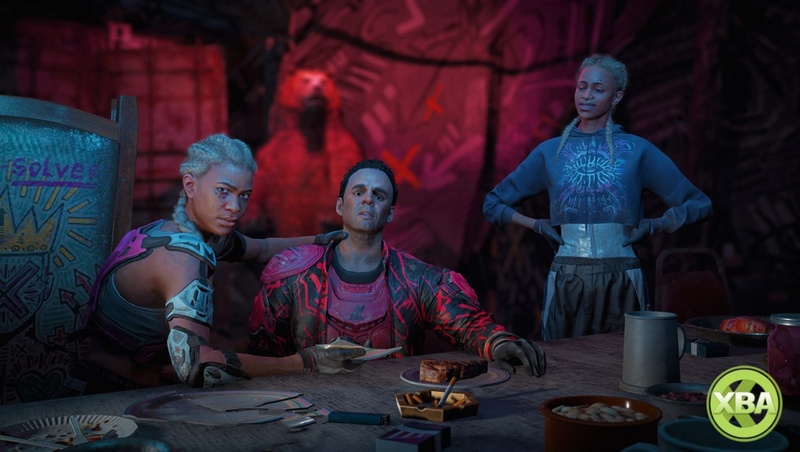 Far Cry New Dawn is very much a standalone experience too, as Papismado notes, and as such, it brings its own new features and changes to the table such as 'RPG-lite' mechanics, alongside more of the stuff that made Far Cry 5 so damn enjoyable. For more on Far Cry New Dawn and what to expect from the colourful apocalypse, read on. The Collapse didn't come out of nowhere, out of the blue. If you've played Far Cry 5 and paid attention while driving the vehicles, on the radio you'd have heard bits and pieces of information about this escalation in the world and what might be happening. That's something we really wanted players to pick up on so that The Collapse felt like it was part of a much bigger plan. Since the end of The Collapse in Far Cry New Dawn, seventeen years have passed, and there were a couple of years of nuclear winter where everything was dead. No more sun in the summer; the sun was covered in clouds, and after a couple of years the sun started to come out. There were large dust bowls going on, moving all this soil left and right, all over the place and then finally there was a little rain coming out. Lots of rain, long periods of rain, harsh rain that got soaked into the soil. Then there's what we call the super bloom, which is a real world phenomenon that you find in the States and across the world. When you find a desert that's super barren and dry, but all of a sudden after the long period of rain, super bloom happens. All of these beautiful colours start coming out, and this is where we get this pink verbena flower, and that's really the base, the foundation for our new world. So, why the post apocalypse? It’s not exactly a traditional pick for the Far Cry universe. Is this canon? Will this affect all other Far Cry games? Bringing Far Cry to a post-apocalyptic setting is something we've wanted to do for a while now, and the end of Far Cry 5 really gave us the opportunity to bring Far Cry into that setting. And that's something we're really excited about, and really want to change things up a bit and really give our own take on what a post-apocalypse setting could be in the Far Cry franchise. I guess a decent follow-up to that question is… do all the Far Cry games take place in the same universe? Or are they alternate universes? Great question, but that's something we really want to keep our fans debating about and I don't want to confirm or deny [that]. When was Far Cry New Dawn conceived? How did it come about? Was it an idea that was born out of Far Cry 5’s development process or was it planned well in advance? As we were developing Far Cry 5 and looking at possible endings we wanted to create narratively, one of the options was the nuclear explosion going off and a catastrophe happening. 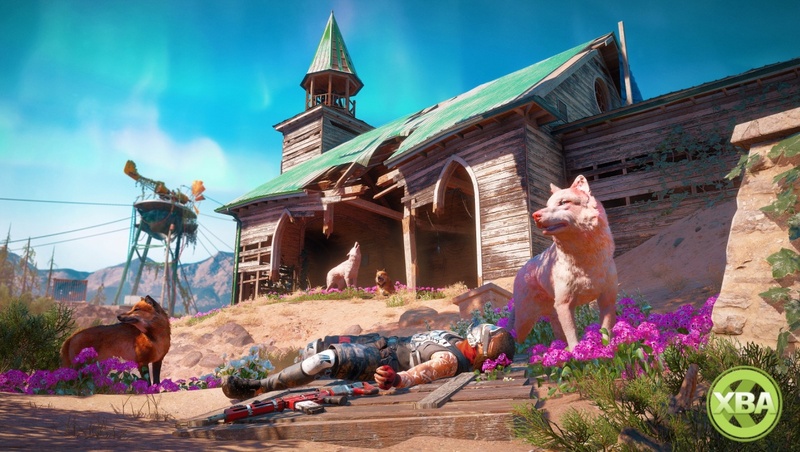 That really excited us because we really wanted to bring Far Cry into a post-apocalypse setting for a while now, and the ending really gave us the opportunity to go into Far Cry New Dawn and tell a story that we really wanted to tell. Am I right in thinking as well that this is the first direct Far Cry sequel/spin-off of sorts? You know, taking place after the events of another game? Is this something that Ubisoft is eager to continue or do you think it’s a one-off? Far Cry New Dawn is a standalone experience, meaning if you haven't played Far Cry 5, this is a fresh, brand new Far Cry experience that we want players to come in and explore and enjoy our world. However, if you are coming from Far Cry 5, we really wanted to continue some of the elements of the story that you've experienced in the past with a lot of easter eggs and so forth. That's something that we're really excited about: players who've come from Far Cry 5 really have that extra layer of exploration. Post-apocalypses have been done to death in video games, but your take on the post-apocalypse is one that is very different… very vibrant. Why did you guys opt for this take on the aesthetics? We knew from the beginning that we really didn't want to create the 'end of the world'. We wanted to focus on this beginning of a new world, and we know that everyone has an opinion on what the post-apocalypse should look like, and we wanted to take that idea, really flip it on its head and do the Far Cry take. That's why wanted something really colourful, beautiful and inviting, and at the heart of it all is the super bloom that really gave us the inspiration with these beautiful pink flowers growing and really taking over Hope County, Montana. Far Cry New Dawn is getting what you guys call “RPG-lite” mechanics, meaning you can craft weapons of certain ranks and what not – and more. What can we expect from the game in terms of RPG mechanics then? How will this enhance the experience? It all started within the context of Far Cry New Dawn, where seventeen years later nothing is being produced in factories anymore, so this idea of 'makeshift' was a really strong inspiration, crafting elements using items you'd find in your everyday life. If you look at weapons, you might have a kitchen knife, a screwdriver and so forth, and that really inspired us to really create this crafting mechanic loop with the idea of this 'lite RPG' approach, and with different levels of weapons and enemies. And it's really challenging players in a way that we haven't done in past entries in the Far Cry franchise. Do you see a world where every game has a little bit of RPG in it? I can't really talk about the industry as a whole, but in Far Cry New Dawn, the idea of a 'lite RPG' element really added to our experience, you know? When we first started testing with it, we weren't really sure what it would give, but after implementing it in the game and playing around with it, it really changed the way we played Far Cry, and that's what we wanted to change for our players; give them something refreshing to play. Can you talk us through the new Prosperity home base mechanics? What is Prosperity, how will it work and what gameplay advantages does it offer? Prosperity is the player's home base. It's a community of survivors and they built a base to defend themselves from the new threat in Mickey and Lou and the highwaymen. The home base has different stations that can help you throughout the game, so whether it's to upgrade your weapons or upgrade your vehicles, upgrade your guns for hire and so forth, we have a bunch of stations that as the player levels up, you'll also level up your stations and gain better guns, better vehicles and better gear to [help you] move forward in the game. When you first get to Prosperity, it's very empty, it's very dull and there's not that much life in it. But as you progress through the game and level it up, kids start coming in, they start repainting the walls, there's more vegetation, more happiness, so as a player, when you upgrade [your base] not only will it change the way you play and the gameplay mechanics, but visually you'll get to see Prosperity gradually look nicer and become full of life. 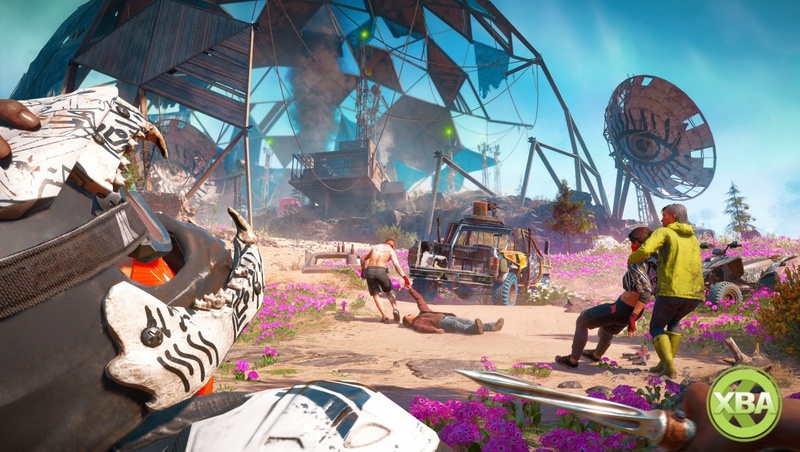 Far Cry New Dawn comes out on what is perhaps the busiest day in terms of releases in the last 10 years (Crackdown 3, Metro Exodus, Jump Force, and of course, Far Cry New Dawn), was the team conscious of that date when things were starting to get set in stone? Not tempted to delay it to miss the manic mid-Feb rush? Yeah, so for us, mid-February has been the date for a while now, and we're really confident with Far Cry New Dawn that what we're delivering and bringing to our Far Cry fans, we have something that's really refreshing for our fan-base. And at the same time it's a different take on the post-apocalypse setting that we think people are really going to appreciate. We really want to surprise [the fans] and give them something different to experience. Also, we hear Hurk is back and he’s 63 – and by hear, we totally read that on a Wiki page – what’s he been up to since the end of Far Cry 5 and how does he fit into New Dawn? Hurk is everywhere and in almost every Far Cry game, but we don't want to give away too much information [about that]. You will come across Far Cry characters from the past, as well as meeting new characters in Far Cry New Dawn. And that's something that we really want players to explore and learn more about what's happened to each character in the game over the past seventeen years. Far Cry New Dawn is out for Xbox One, PlayStation 4 and PC on 15th February. 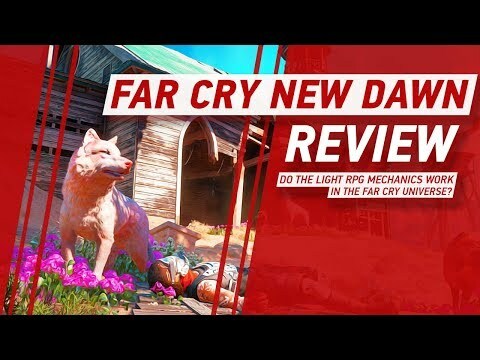 Far Cry New Dawn Video Review: Are the Light RPG Mechanics a Game Changer? Far Cry New Dawn Comparison: How Does the Floral Pink Apocalypse Measure Up?